Polish invasion of Russia 1919; The Curzon Line 1919 - 1920; Treaty of Riga 1921. The Curzon Line was a demarcation line between the Second Polish Republic and Bolshevik Russia, first proposed on December 8, 1919 at the Allied Supreme Council declaration. The line was authored by British Foreign Secretary, George Nathaniel Curzon, 1st Marquess Curzon of Kedleston. In the wake of World War I and the Russian Civil War, the two countries disputed their borders, and the Polish-Soviet War erupted. ...the line was based on the ethnic composition of the area. 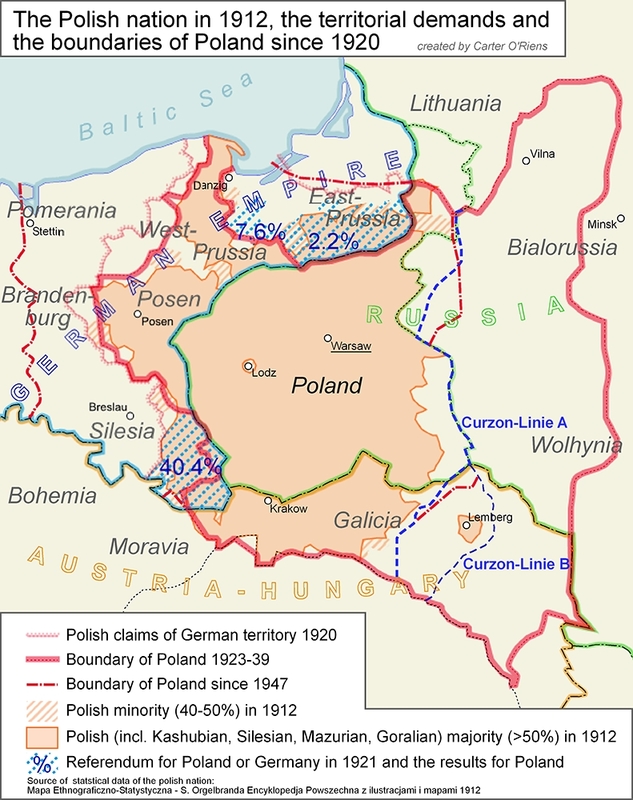 ... the final Peace of Riga (or Treaty of Riga) provided Poland with almost 135,000 km� (52,000 sq mi) of land that was, on average, about 200 km east of the Curzon line.